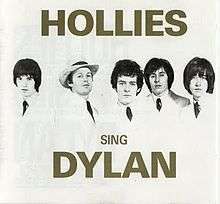 Hollies Sing Dylan is a 1969 cover album where the Hollies sing Bob Dylan songs. It was also released in the US as Words and Music by Bob Dylan with a different cover but using the same band image and track order. First released on compact disc in West Germany in the late 1980s, it was not released in that format in the rest of Europe until 1993. For this issue, two bonus tracks, the single version of "Blowin' in the Wind" and a live version of "The Times They Are a-Changin'". A later remastered issue in 1999 added a third bonus track, a live version of "Blowin' in the Wind". I'd written what I thought were some interesting songs at that time — 'Marrakesh Express', 'Right Between the Eyes', 'Lady of the Island' — and the Hollies weren't interested in them. And when I said in the first 'Sleep Song' for instance, 'I'll take off my clothes and I'll lay by your side', they said, 'Hey, you can't bloody sing that. We're not going to sing that filthy stuff.' Saying those things to a stoned musician is ridiculous. This happened at the same time they wanted to make an album with Dylan tunes. I thought even that was a sacrilege, because we were doing them like [Graham starts singing "Blowing in the Wind" in swing fashion, snapping his fingers]: 'How many roads, yeah, would a . . .' — a Las Vegas type thing, and it was driving me nuts. I couldn't handle it. At the time I was pleased with the album but on reflection, I don't think it was a good move for the Hollies. People knocked it, saying, 'How could they ever relate to Dylan?' We thought we'd do it for Hollies fans, but I was really just reading Dylan's words, not singing them. I could have been a lot better. This is the first album with new member Terry Sylvester, who replaced Nash. All songs written and composed by Bob Dylan. String arrangements and composing on "Blowin' in the Wind" by Mike Vickers. All other strings arranged and conducted by Lew Warburton. 1 2 Eder, Bruce. "The Hollies — Hollies Sing Dylan (Overview)". Allmusic. Retrieved 22 November 2010. ↑ Mendelsohn, John (1 November 1969). "Words and Music by Bob Dylan". Rolling Stone. San Francisco: Straight Arrow Publishers, Inc. (45): 39. 1 2 Hollies Sing Dylan (LP). The Hollies. Parlophone Records. 1969. PCS 7078. 1 2 Zimmer, Dave (2004). 4 Way Street: the Crosby, Stills, Nash & Young Reader. Cambridge: Da Capo Press. pp. 224–228. ISBN 978-0-9722591-5-6. ↑ Kirsch, Bob (13 July 1974). "Allan Clarke Back; Hollies Riding High". Billboard: 16, 20. Retrieved 1 February 2011. "Stay" / "Now's the Time"
"Just One Look" / "Keep Off That Friend of Mine"
"We're Through" / "Come On Back"
"Yes I Will" / "Nobody"
"I'm Alive" / "You Know He Did"
"Look Through Any Window" / "So Lonely"
"Bus Stop" / "Don't Run and Hide"
"Stop Stop Stop" / "It's You"
"On a Carousel" / "All the World Is Love"
"Carrie Anne" / "Signs That Will Never Change"
"Sorry Suzanne" / "Not That Way At All"
"He Ain't Heavy, He's My Brother" / "Cos You Like to Love Me"
"I Can't Tell the Bottom from the Top" / "Mad Professor Blyth"
"Gasoline Alley Bred" / "Dandelion Wine"
"Hey Willy" / "Row the Boat Together"
"The Baby" / "Oh Granny"
"The Day That Curly Billy Shot Down Crazy Sam McGee" / "Born a Man"
"The Air That I Breathe" / "No More Riders"
"Sandy (4th July, Asbury Park)" / "Second Hand Hang-Ups"
"Stop! In the Name of Love" / "Musical Pictures"
"(Ain't That) Just Like Me" / "Hey What's Wrong With Me"
"Searchin'" / "Whole World Over"
"If I Needed Someone" / "I've Got a Way of My Own"
"Son of a Rotten Gambler" / "Layin' to the Music"
"Boulder to Birmingham" / "Crocodile Woman (She Bites)"
"Star" / "Love is the Thing"
"Daddy Don't Mind" / "C'Mon"
"Wiggle That Whotsit" / "Corrine"
"Hello to Romance" / "48 Hour Parole"
"Something to Live For" / "Song of the Sun"
"Soldier's Song" / "Draggin' My Heels"
"Heartbeat" / "Take Your Time (new version)"
"Holliedaze (A Medley)" / "Holliepops (A Medley)"
"Take My Love and Run" / "Driver"
"Too Many Hearts Get Broken" / "You're All Woman"
"This Is It" / "You Gave Me Strength"
"Reunion of the Heart" / "Too Many Hearts Get Broken"
"Find Me a Family" / "No Rules"
"The Woman I Love" / "Purple Rain (Live Version)"
"Hope" / "Shine On Me"
"Pay You Back With Interest" / "Whatcha Gonna Do 'Bout It"
"Just One Look" / "Running Through the Night"
"Dear Eloise" / "When Your Light's Turned On"
"If I Needed Someone" / "Yes I Will"
"Do the Best You Can" / "Elevated Observations"
"Survival of the Fittest" / "Man Without a Heart"
"Long Dark Road" / "Indian Girl"
"Jesus Was a Crossmaker" / "I Had a Dream"
"Slow Down" / "Won't We Feel Good"
"Don't Let Me Down" / "Layin' to the Music"
"Another Night" / "Time Machine Jive"
"Write On" / "Crocodile Woman (She Bites)"
"Draggin' My Heels" / "I Won't Move Over"
"Writing on the Wall" / "Burn Out"
"If the Lights Go Out" / "Someone Else's Eyes"
"Casualty" / "Someone Else's Eyes"
"Non Prego Per Me" / "Devi Avere Fiducia in Me"
"Kill Me Quick" / "We're Alive"